I know I shouldn't be thinking about Autumn just yet, but how gorgeous are these late summer arrivals from Madewell?! My your are an early shopper. I'm loving floral prints.... so my favourite is the second to last pic, the one with the white (ahh! white! love) jacket. I think that would be a great transition outfit. transitions!! oh no....but I do love them so. I don't think I could pull it off but I LOVE the jeans, the striped t and those fab shoes. I hate how fall clothes are already in shops! they are so pretty I can't resist looking at them, but thinking about Fall depresses me! I love the dress in the first photo. 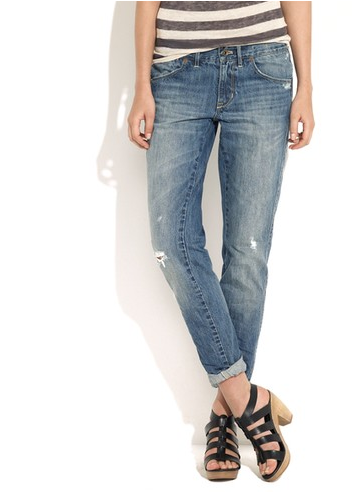 loving the cropped boyfriend jeans! Adorable! I love fall fashion.